A strong defensive start for the Gliders helped to control their tempo of the game, keeping Great Britain to a last second shot on their first attempt, followed by a three second call before Amber Merritt was found inside where she made no mistake dispute the contact. The Gliders were able to keep Great Britain scoreless for the first two and a half minutes of the game, while Merritt was shooting at a high percentage from the other end with all six of the Gliders’ points. It wouldn’t take Great Britain long to reply as Helen Freeman proved to be a difficult matchup as she was able to knock down everything when left open. It wouldn’t take Coach David Gould long to call his team in after Freeman was found alone one too many times. Cobi Crispin was able to make an impact on the game early, knocking down a midrange shot midway through the first, while Merritt’s early shooting streak ended after Great Britain applied some strong pressure through some well executed back picks. 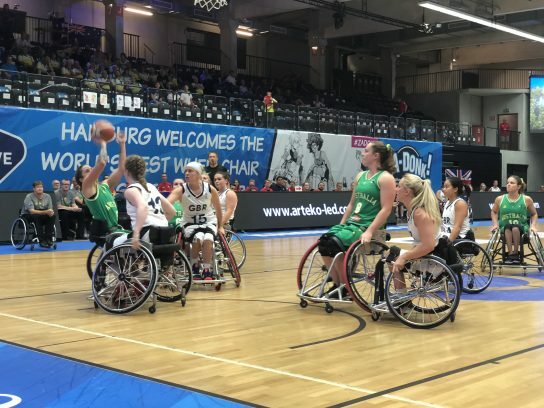 Great Britain would prove to be a tough matchup defensively for the Gliders as the size and touch of Amy Conroy continued to test the high-pointers for Australia. The second quarter saw the Gliders unable to buy a basket as Great Britain shot the lights out to increase their lead to ten points before Georgia Munro-Cook put an end to Australia’s drought with her first make of the game, shortly followed by a second. The speed of Kylie Gauci would prove crucial for the Gliders, as she was able to work he way through the tough British press and find some much needed scoring for Australia. Great Britain’s full court press would continue to prove difficult for the Gliders to deal with as the pressure forced 7 Gliders turnovers which the Brits made no mistake in converting, steadily increasing their lead to sixteen points by half time. The third quarter had Munro-Cook find the bottom of the net first, however Great Britain would continue to match Australia’s shooting. Shelly Chaplin would find her first points of the game as the momentum began to shift in favour of the Gliders with shots finally beginning to fall. Great Britain moved away from their full court press in the third term, opting for a more traditional defensive approach. At times, the Gliders were able to capitalise on this however the shooting of Great Britain was able to match any offensive effort the Gliders put forward. Lindsay started the fourth term with a much-needed basket for the Gliders, knocking down a shot from the free-throw line, only her second make of the match. Shortly after Lindsay would make her second in a row providing an ever so small glimmer of hope for the Australian side. Offensive fouls were a problem for the Gliders, with ten more personals called on the Australians as compared to their opponents. With five minutes left in the fourth quarter, Crispin obtained her fourth personal and put GB into the bonus. Australia would implement their own full court press to finish off the game, however nothing the Gliders tried was able to stop the flow of points as Great Britain continued to extend their lead and close out the game 25-point victors. The Gliders will next face Spain, who are yet to win a game, in the final day of pool play tomorrow night.